Screw you guys!! You showed up yesterday by the Court in downtown Brooklyn and I was able to try your caramel popcorn and it was truly the best. Today I go outside wanting to try the kettle corn and there is no truck in sight! Now how am I supposed to fill my addiction if your truck keeps moving around. Put that truck back in downtown Brooklyn where it belongs!!!! I am very disappointed. I asked for a mix of cheese and caramel and all I got was caramel. As expensive as this popcorn is there should be no reason that I can't get what I paid for. HALF caramel HALF cheese. Received a small tin as a gift with the caramel popcorn and it was delicious! It was fresh and flavorful. The tin lasted less than 24 hours in our house. Next time I will be ordering a large tin! 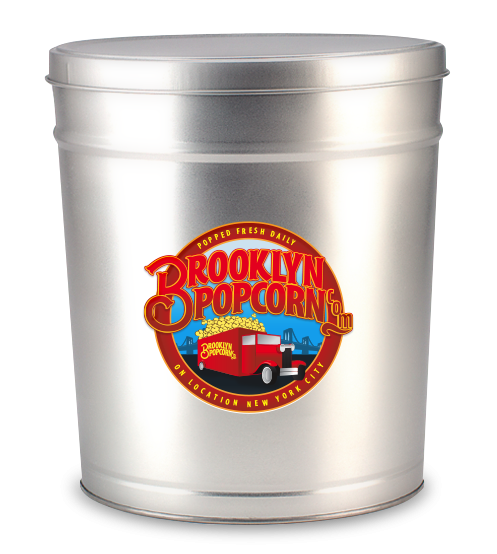 Can you do custom labels on popcorn tins? I have to say, I’m disappointed that all my popcorn was gone in one day….oh, that’s my fault. 1-gallon is just the right size for me! We ordered this size for the whole family and boy, did it go fast! Next time we’ll try the 2 or 3.5 gallon because we have a big family. I am delighted at how much popcorn one gallon is. It really surprised me. Giving one to each of my bridesmaids. You think one gallon and instantly you picture a gallon of milk, but this seems like more than a gallon of popcorn…an endless amount of fluffy cheese popcorn everywhere! 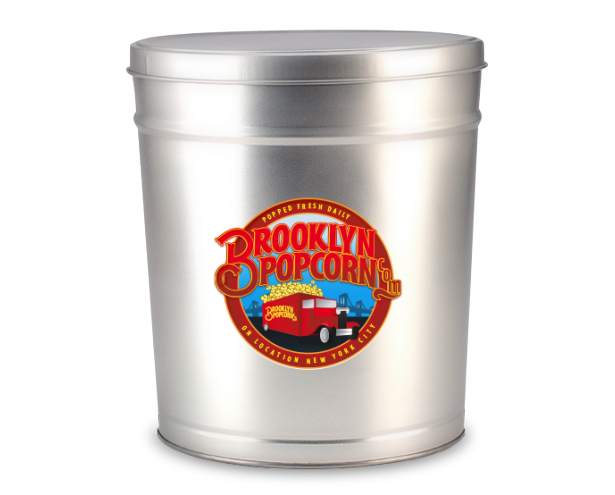 I ordered the 1-gallon tin for my three kids – I was worried it wouldn’t be enough popcorn, but everything worked out fine and there was even enough for sharing with me! We ordered the 1-gallon tin to share. We expected a small container with even less popcorn, but were pleasantly surprised to find this was enough for 2 people for a couple of days. Well worth the price. Man, I ordered the 1-gallon tin and was surprised that it was really enough to eat off of for days. I’m impressed.